I love the look of these mirrored medicine cabinets. What I love most about them, and why I decided to do a post just featuring this one photo, are the mirror lined shelves. This is one idea I know I am eventually going to use some where! These mirrored shelves make me think of high end perfume shops. They just add an extra special Ooolala to the look. 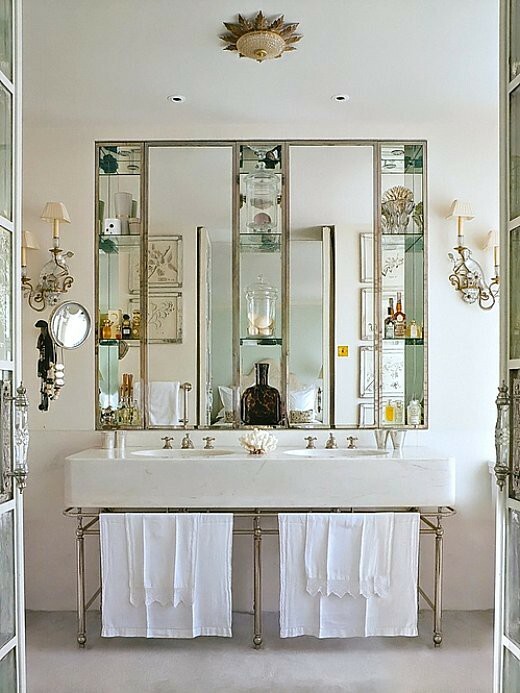 If you like the idea of using mirror to showcase your beauty products, then you have to check out Kevin Sharkey's (a big wig at Martha Stewart with an amazing eye for style) bathroom, he used mirror in a lot of great ways in his bathroom. You can check out the post I did on Kevin Sharkey's bathroom here. I'm guessing the mirror is custom made? Any ideas on where to find something similar? Check out the vintage medicine cabinets on ebay, I spotted a few that could be used as your base and then you could go to a mirror shop to have the side mirror shelving added. This might/might not save you some $$ if you get the mirror off ebay, craigstlist etc...however, you can get a more unique vintage look. Be careful thought, matching up the metal mirror to the metal that goes around the shelving might be tricky or impossible to get the matching size and shape, so that's why I say it may or may not be cheaper to start with a vintage mirror. However, don't worry if the metal color is different then what you want, this can be changed, a bodyshop can repaint it for you or you can get it metal plated. You will probably want to do this to match up the metals perfectly with the metal trim of the custom built shelves. Otherwise, if you are close to NYC, then there is a great mirror company that did all the mirrored shelving for Kevin Sharkey's bathrooms. In that post there is a link to a video or photos showing the guy installing the mirrors and a link to the company's website. I think if you contact either one of these companies and ask for referrals,if they are not in your area, would be a good idea. You can send them the photo and ask for a quote. Don't forget to consider looking at ebay, antique shops, flea markets too. You could even forgo putting the metal around the shelving. Hope this helps. Please let me know what happens!